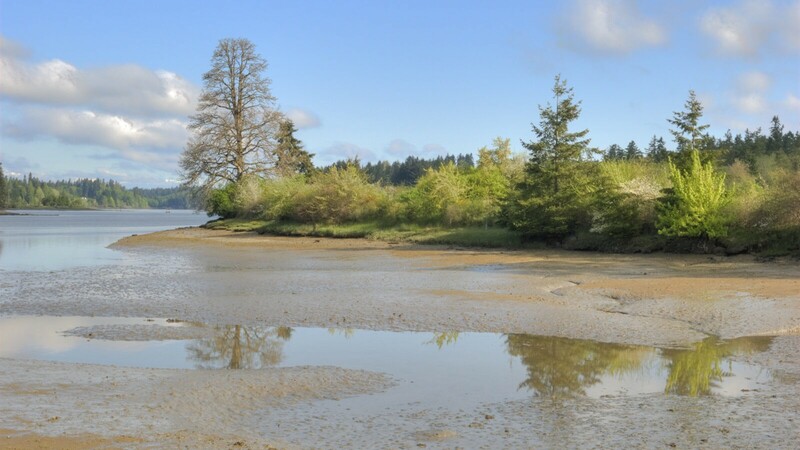 55 acres located along the eastern shores of Henderson Inlet in Thurston County. Half of the property consists of fresh and salt water wetlands, a riparian corridor, and a large agricultural field, while another 25 acres is upland forests of Western redcedar, Douglas fir and bigleaf maple. Over one hundred species of shorebirds, waterfowl and songbirds visit the property, as well as many mammals, including raccoon, black-tailed deer, coyote, red fox, Pacific jumping mouse, river otter and a variety of bats. The diversity of animal species is most certainly a product of the “edges” where different habitat types meet. My family – mother, father, sisters and brother – came to the Sampson place in 1919 to make it our home. Since it was the beginning of the Great Depression there was no money for our neighboring rancher to buy our huge cattle ranch in the grass hills north of Boise, Idaho. The banks were closed when my Dad and Mr. Dobson went to Boise to close the deal. We worked on the WPA, in the Olympia Cannery, and picked berries to buy our new home, with the patient help of a federal land bank loan. My Dad, Rolla Myer, had several “no hunting, no shooting – wildlife sanctuary” signs made, which showed the world our great love of the woods, fields, shoreline, bay and wetlands; all with their rich flora and fauna and scenery. All these years we’ve treasured these acres and as a stewardship responsibility to family, the community, the country and the world. It is a great blessing to accept the Capitol Land Trust conservation easement as an umbrella of protection “in perpetuity” to keep the many special qualities of the place for generations of family and friends of the farm and of the earth. With the mercury at 98 degrees that July evening, I was grateful for the dim canopy of upland forest to start my walk. I slipped downhill, past the cedar swamp, and nodded toward Harmony Glover’s home. Her 50 acres on the east shore of Henderson Inlet was protected with a conservation easement in 1991. Harmony Farm was a busy place that evening, for the dry weather was just right for the flayers working the north field. The farm is a blend of wildlife habitat and agricultural areas. The two uses overlap where old orchards mix with native service berry and Indian plum to create a tangle of fruits used by both human and wildlife tenants of the farm. As if to prove it to me, a flock of chestnut-backed chickadees arrived to forage in the apple trees, hanging precariously from topmost branches to gather insects. Despite the heat, I was drawn to mudflats fringing the extensive shoreline. I crawled out on an old log to watch the incoming tide, and reflected that undisturbed Puget Sound shoreline like this becomes rarer every day. The low bank is knit together by the roots of Douglas fir, cedar, native roses, Oregon grape, and oceanspray. Pickleweed and fleshy jaumea grow at the edge of the mudflats, where their succulent leaves are inundated twice daily by the tides. Although abundant flora dominates the shoreline view, scattered dead and dying trees are perhaps the more significant features. Trees edging shorelines such as these supply a regular source of woody debris to the marine environment. As dying trees lean over the water, they provide hunting perches for eagles and kingfishers, and suitable wood for cavity nesting birds. Fallen trees rest in the mudflats, often partially exposed even at high tide. Herons use the emergent wood to combine their daily chores of foraging and resting, and they can extend their foraging beyond low tide by standing on emergent wood when the water is too deep for wading. Other water birds use this wood for resting as well. Fallen wood eventually becomes the domain of barnacles, and ultimately, wood borers. These borers degrade wood to a powder that becomes part of the organic detritus at the base of the food chain in these shallow bays. The shores of Harmony’s place are constantly fed with woody debris. I watched a kingfisher perch on one snag to eat its dinner, noticed nesting holes in other snags, and wondered how long some calf them would maintain their rakish angles before joining the ancient logs scattered in the mudflats. Nearby is a little inlet, which features a four acre salt marsh at its innermost curve. I struck off around the edge and tangled with the brambles of a Nootka rose. Something moved in the branches, and a little black eye peered at me. The yellow breast and olive back of a tiny bird told me it was a female Wilson’s warbler. She worked the thicket thoroughly, gleaning insects from the foliage while she kept that wary eye on me until I turned away. Ahead, the silvery undersides calf Pacific silverweed were turned upwards. An animal had meandered through the saltmarsh ahead of me and disturbed the foliage, but left no clues as to its identity. Perhaps the warbler knew, but I had no way to ask. The tide rose imperceptibly; mirrored shoreline vegetation replaced opaque mudflats. Two spotted sandpipers teetered and nodded in an ever-narrowing band of mud, searching for tasty crustaceans. The water rose to lick the curved edge of saltmarsh grasses. Perpetually grey green with its twice daily taste of salt, the edge contrasted with the richer hues of pickleweed, Douglas aster, and rushes behind it. Time and tide finally forced the sandpipers to fly. I left too, marveling at the abundance of life nestled there on Henderson Inlet.